Ajay Devgn, Anil Kapoor, Madhuri Dixit recreate Paisa Yeh Paisa! 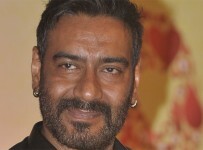 Ajay Devgn, Anil Kapoor and Madhuri Dixit feature in the recreated version of Rishi Kapoor’s song from ‘Karz’, ‘Paisa Yeh Paisa’ for ‘Total Dhamaal’. The song also stars Jaaved Jaaferi, Arshad Warsi, Riteish Deshmukh, Indra Kumar, Sanjay Mishra and Pitobash. Madhuri cited ‘Paisa Yeh Paisa’ as one of her all-time favorites. “I’m really happy that Indra Kumar has decided to revisit this classic number. It’s a song that I’ve grooved to for so many years. Even after so long, it retains its energy,” she says. ‘Total Dhamaal’ is an adventure comedy, set to release on December 7.